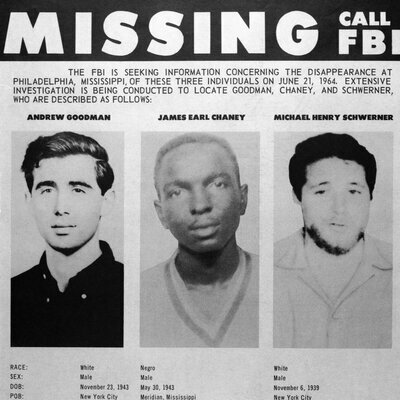 My childhood friend Andy Goodman was murdered in Philadelphia, Mississippi on June 21 52 years ago, along with James Chaney and Michael Schwerner. He sought to do the right thing. One Klan monster, preacher Edgar Ray Killen, has been convicted 43 years later of murder and is currently in jail. See the film "Neshoba" by Micki Dickhoff about this, which includes long interviews with Killen. But today the Attorney General in Mississippi has closed off further investigation. I almost went to Mississippi Freedom Summer. But I had been on a dangerous freedom ride to Chestertown, Maryland in 1961 - knew that Mississippi was even more dangerous - and no one invited me. I was convinced that the civil rights movement was a great hope in America, and that what people did in going was both courageous - I learned just how courageous - and noble. What they did stands for the equality in America which is the hope of the country (that we each count equally as part of the common good, "all of us" as Bernie Sanders likes to say). Andy believed in equality and gave his life for this. He and James and Mickey should be remembered today, and the many, many others, who against long odds and ferocious brutality, have worked to change this country for the better. “'Today, rather than using murder, unscrupulous people have found new disenfranchisement tactics to prevent whole communities from voting in order to retain political advantage,' writes David Goodman, Andrew Goodman’s younger brother." 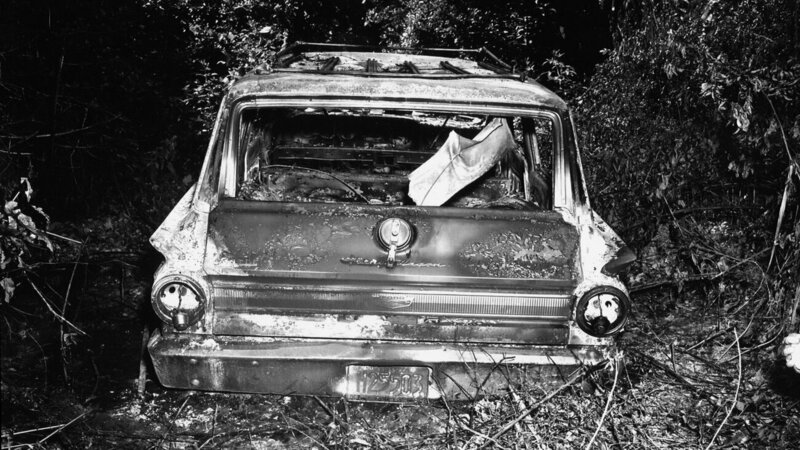 In this picture released by the FBI and the State of Mississippi Attorney General's Office, the burned-out station wagon that slain civil rights workers James Chaney, Andrew Goodman and Michael Schwerner were driving in is seen in June 1964 in the Bogue Chitto swamp, some 13 miles northeast of Philadelphia, Miss. Mississippi officials are closing the investigation into the murder of three young civil rights workers by the Ku Klux Klan — more than 50 years after the men disappeared. The case had been closed for decades, then reopened after renewed public outcry. Now it's going cold again. "It's just gotten to the point that it's 52 years later and we've done all we can do," Mississippi Attorney General Jim Hood said Monday. The murder of James Chaney, Andrew Goodman and Michael Schwerner in Neshoba County, Miss., inspired the movie Mississippi Burning. Exactly 52 years ago, on June 21, 1964, the men disappeared after working to register black voters. They'd been at a church that had been a target of Klan violence the week before. After they left the church, "they had a run-in with local authorities, they were arrested, they were put in jail — and shortly after they were released they went missing," NPR's Debbie Elliott reports. Their bodies were discovered after a 44-day search that garnered widespread national attention. But while the men were missing, Mississippi officials downplayed the significance of the case. "At the time Mississippi officials were calling it a hoax devised to garner sympathy for the civil rights movement," Debbie says. "The bodies were then found buried in an earthen dam off a remote country road," she says. "They had been shot to death." In the years that followed, the state did not prosecute anyone for murder. A few men served a handful of years in prison on federal civil rights charges, but otherwise, the KKK mob that killed Chaney, Goodman and Schwerner escaped legal consequences. Decades later, the state reopened the case and prosecuted one man for murder — Klan leader Edgar Ray Killen, aka Preacher Killen. Now 91, Killen is serving a 60-year sentence for manslaughter. In the 11 years since Killen was convicted, no other suspect has been brought to court. On Monday, Hood announced that the case was going to be closed — again. "The passage of time means that memories have faded. Both participants in this crime and many of the witnesses have since died. Evidence hasn't been preserved. "There are at least two known suspects who are still alive, but the state hasn't been able to build a strong enough case against them to prosecute. "I'm not sure anyone really expected more prosecutions, although there's always the hope that someone might have a deathbed confession and be willing to offer more details of what happened. While the investigation is closed, if someone were to come forward with new information it could be reopened. Schwerner's widow, Rita Schwerner Bender, tells Debbie that the reality of the situation is that it's too late to achieve justice — and has been for a long time. She also sharply criticizes the state of Mississippi. "The state was complicit in so much of the violence. It encouraged racism and participated in it," Bender tells Debbie. "The state refuses to acknowledge and make amends for its racist past and role in the terror,' Bender says, pointing, among other things, to today's leaders in Mississippi who refuse to remove the Confederate battle flag from the state flag. For his part, Attorney General Hood says he believes the state has done everything "that could possibly be done" in this case. He released an FBI report on the murders which addresses the two remaining suspects and explains that they had unsuccessful charges brought against them before. "For these participants, the good Lord will have to deal with that," Hood said, according to The Associated Press. Closing the investigation, Hood said, "sort of closes the chapter on an era that we didn't want to have in public view. We were ashamed of that." States with new voting restrictions have 70 percent of the electoral votes needed to win the presidency. On June 21, 1964, the civil-rights activists James Chaney, Andrew Goodman, and Mickey Schwerner were abducted in Neshoba County, Mississippi, and brutally murdered by the Ku Klux Klan. The killings in Mississippi, where only 6.7 percent of African Americans were registered to vote in 1964, shocked the nation and helped lead to the passage of the Voting Rights Act. The legacy of Reagan’s opposition to the VRA still defines our politics today. Paul Manafort, who directed Reagan’s Southern strategy in 1980, is now Donald Trump’s chief strategist. Trump lifted Reagan’s 1980 campaign slogan, “Let’s Make America Great Again,” for his campaign. John Roberts, a young lawyer in the Reagan administration who wrote dozens of memos at the time criticizing the VRA, three decades later authored the majority opinion gutting the law, ruling that states with the longest histories of voting discrimination, like Mississippi, no longer have to approve their voting changes with the federal government. The 52nd anniversary of the murders of Chaney, Goodman, Schwerner coincide with the third anniversary of the Shelby County v. Holder decision. The full impact of that ruling will be felt in this year’s election, the first presidential election in 50 years without the full protections of the VRA. 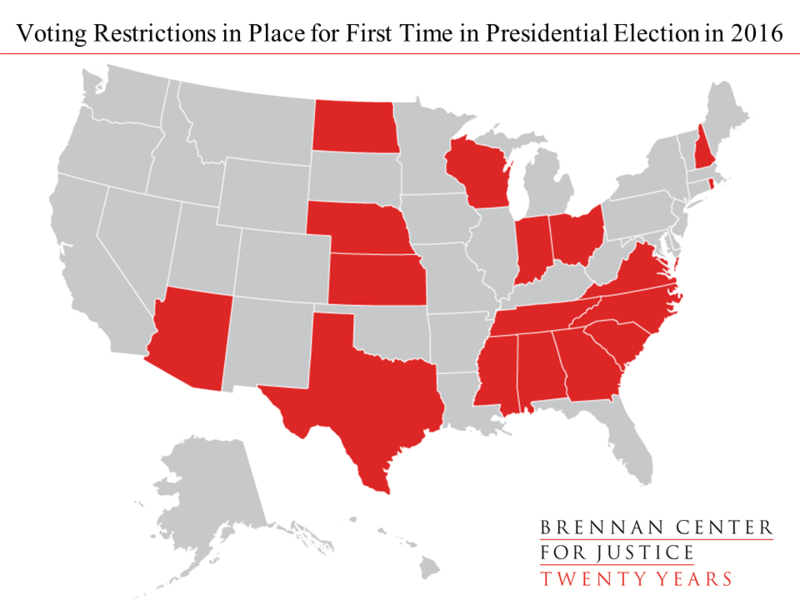 Seventeen states have new voting restrictions in place for the 2016 presidential race, including more than half of those previously covered by Section 5 of the VRA, and representing 189 electoral votes, 70 percent of the 270 electoral votes needed to clinch the presidency. “Today, rather than using murder, unscrupulous people have found new disenfranchisement tactics to prevent whole communities from voting in order to retain political advantage,” writes David Goodman, Andrew Goodman’s younger brother. North Carolina is the most striking example of the devastating impact of the Shelby County decision. A month after the ruling, the state passed a sweeping rewrite of its election laws, including requiring strict voter ID to cast a ballot, cutting early voting, and eliminating same-day registration, out-of-precinct voting, and pre-registration for 16- and 17-year-olds. These restrictions were upheld in April by federal district court Judge Thomas Schroeder, a conservative George W. Bush-appointee. The US Court of Appeals for the Fourth Circuit will hear a new challenge to the case today. Schroeder’s 485-page opinion ignored the many stories of voters who were turned away from the polls because of the new restrictions, like the elimination of same-day registration and out-of-precinct voting in 2014, and the new voter-ID law in the 2016 primary. 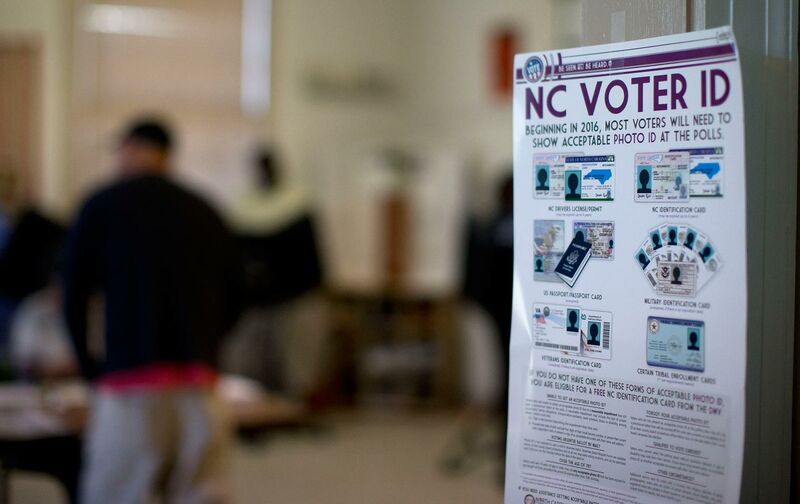 In 2014, Democracy North Carolina documented 2,300 cases like Hicks’s of voters disenfranchised by the new restrictions. By comparison, there were only two cases of voter impersonation in the state from 2000 to 2012, out of 35 million votes cast.